In an interview with WNPR’s Ray Hardman Monday, National Women’s Hockey League founder and future commissioner Dani Rylan confirmed that the NWHL would offer international visas to non-United States citizens who were drafted into the league or joined as free agents. This means that the CWHL could see players that intended to join them over the following years instead opt for the league that will pay them as well as give them visas that will allow them to work in the U.S. The National Women’s Hockey League has announced its regular season will last from October to March and cover 18 games, coming out to one game per week, plus two rounds of playoffs to cap the season. According to Mike Burse, players will have a say in the rules of the league, something the CWHL has not conceded to players in general. ‘The current professional league in Canada — the women aren’t paid there so the number one thing that could potentially be intriguing to a player is the idea of getting paid for being the best at what they do,” said Rylan in her interview with Hardman. The NWHL announced its existence last Thursday and has already made a splash in the world of women’s hockey. Counting the NWHL there are currently two professional women’s hockey leagues in North America, and only one will pay its players. The CWHL, which has been in place since the 2007-08 season and is responsible for the development of the women’s game at a professional level thus far. It has garnered support from people such as Lisa-Marie Breton-Lebreux and Trina Crosby (whose son is NHL Penguins captain Sidney Crosby) and given the women who are maintaining Olympic-caliber skill a place to continue to develop. 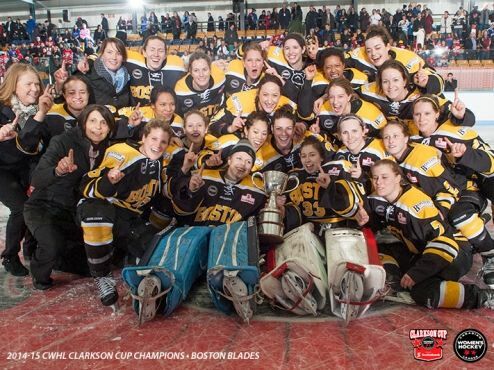 Your 2015 Clarkson Cup champion Boston Blades! The CWHL has even been able to sign a four-year deal with Sportsnet to broadcast the CWHL’s playoffs and special events, beginning with this past season. This was touted as a much-needed first step towards achieving parity in the men’s and women’s pro hockey leagues: television contracts lead to exposure, and exposure leads to fans and sponsors. Even more recently the CWHL announced a partnership between itself and the Montreal Canadiens, who would help their sister team, the Montreal Stars, through cross-promotion, sponsorship (though they did not specify what or how much that sponsorship was for) and more. Despite these advances there has been trouble within the CWHL within the last 6 months; many of the Boston Blades went on strike in November when it seems they were asked to commit to three years of play without pay. If the Blades ended up committing to those three years, the CWHL was lucky to sew that contract up when they did; the temptation to actually get paid for their work might have proven too much for some of these Olympians. The CWHL expects its players to work free and have not made a timeline public as to when those in charge expect to be able to pay the athletes. The NWHL’s aim is to change that, and by paying their players have opened up new avenues for women who would like to go pro but cannot live and work in Canada or near the one CWHL team in the U.S. without a visa. “Since it is a paid league we also offer visas for international players so the women who maybe went to college in Boston and want to stay in the Boston area will have the ability to do that because they’ll have the visas,” Rylan told Hardman. This opens up avenues for players such as Noora Räty, the Finnish goaltender who graduated from the University of Minnesota as the Golden Gophers’ starting goaltender, with a .956 save %. After Räty announced her retirement from hockey at the tender age of 24, citing exhaustion and an inability to continue “working full-time and trying to train like a pro athlete” while still struggling to pay basic bills. Räty did end up signing with a men’s league in Finland, Kiekko Vantaa, nearly six months later, for pay. “There are differences [in the way men’s and women’s hockey is played] but in the end it’s not that much different for a goalie,” she said in an interview over the fall of 2014. While she is currently playing with a men’s team and may very well decide to finish out her career there, the opportunity to play with a women’s team will be a great draw for many international players who attended college in or trained in the U.S.
You can listen to Rylan’s interview below.